If you suspect that you’re in need of binge eating disorder treatment, we know that you can feel ashamed, afraid, and even nervous about whether or not your treatment will be a success. For most people, they have tried every diet on the planet and only after years of going back to the same behaviors, do they start to realize that this is an emotional problem, not a food problem. In the meanwhile, individuals struggling with BED deal with intense feelings of self-hatred, body shame and insecurity, and other mental health issues that you’ve never shared with anyone before. In this post, we’ll tell you everything you need to know about getting treatment for binge eating disorder. Remember that recovery is possible. When you’re ready to learn more about how to take that first step towards a healthier, more meaningful and peaceful life, we encourage you to read on. 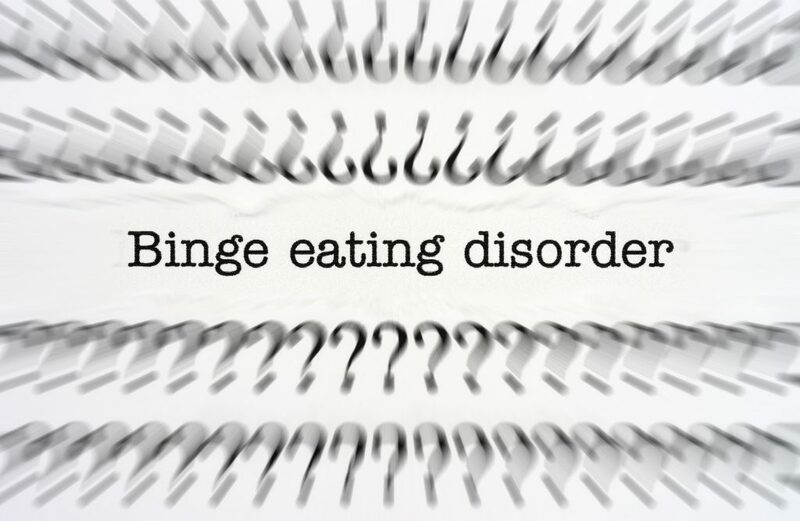 What Is a Binge Eating Disorder? Before we speak more about options for successful binge eating disorder treatment, let’s quickly define what it is. Also known as BED, binge eating disorder is defined by compulsive overeating — even when the person is no longer hungry or already feels uncomfortably full. In addition to eating large amounts of food, those with BED will also eat extremely quickly. When eating, the sufferers will feel a complete loss of control over their ability to stop eating. In some cases, they will eat in secret, and will often experience intense shame, guilt and depression afterward. It is not unusual for a person to consume several thousand calories in a single binge episode. One reason why people are able to consume so much at one time is because they dissociate, or disconnect from themselves both mentally and physically, to the point that they are literally unaware of how much they ate. Binge eaters often report that they almost go into an altered state or a trance-like state when they binge. In this altered state, individuals are less connected to their own physical sensations and are therefore capable of eating beyond the point of fullness. Sometimes it is only the sensation of pain from being overly full that helps someone stop the binge. To meet criteria for the diagnosis, a person must binge a minimum of one time a week for a period of three months. It is important to remember that unlike bulimia, there is no compensatory behavior after the binge. Bingeing can often, but not always, lead to sudden weight gain, which often makes the patient feel more ashamed of and uncomfortable with her body. In addition, individuals with BED often get feedback from medical professionals and others who tell them that they need to lose weight, not understanding that they have an emotional issue with food. Unfortunately, it’s difficult to pin down the exact causes of BED. There appears to be a nature versus nurture situation when understanding the causes of BED. While many of the causes of BED are similar to those of other eating disorders, it may also involve genetic and environmental influences. Research has shown that individuals tend to have difficulty with impulse control. For some, BED can also evolve from another type of eating disorder, or even as a result of extreme dieting. Sadly, eating disorders are on the rise throughout the world. If you’re concerned that you or someone you love may have Binge Eating Disorder, it’s important to be aware of the symptoms. While learning about the symptoms of BED doesn’t qualify you to make a diagnosis, it can start the conversation about getting help. You may be dealing with BED if you frequently feel unworthy, undesirable, or disgusted with yourself after eating. You may also feel a need to hide your habits from others, which results in hoarding food and even hiding financial records so no one else knows what you’re spending on food. As much as you’d like to stop bingeing, it may not be under your control at this point. If this describes you, it is important to acknowledge these feelings and to seek help from a professional with training and experience in binge eating disorder. If you think that you may be struggling with binge eating disorder, consider getting treatment to get the help you need. The good news is that there are lots of different treatment options for binge eating disorder. You can meet with a therapist, or even join group therapy with other people who struggle with eating disorders. This will help you to address the reasons and triggers for your eating disorder and allow you to identify and break patterns of these behaviors. For many people who seek to treat BED in an outpatient setting, they have a treatment team, composed of a nutritionist, therapist, medical doctor, and sometimes a psychiatrist. By having a coordinated team, you’ll more easily learn healthy coping skills, understand mindful eating, and learn how to listen to your body and control your impulses to overeat. Depending on the severity of your BED, as well as whether or not you have additional mental health issues, you may be a candidate for residential treatment. In some cases, attending family therapy can be helpful to support individuals meet their recovery goals. If you are living with other family members or a life partner, it may be helpful to have some sessions with a family therapist in order to address any dynamics in the family that may be inadvertently reinforcing the eating disorder. This may also help loved ones learn more about binge eating disorder and how to more effectively support you in your recovery. It also provides an outlet of support for your family members, who may be experiencing stress and worry related to your well-being. We hope that this post has helped you to better understand the signs and definition of binge eating disorder. We also hope that you’ve come away with at least a bit of an understanding about what you can expect out of your binge eating disorder treatment. There are a wide variety of different eating disorder treatment services available to you. Do your own independent research, and reach out to a professional to go over these potential options in greater detail. Are you ready to get control over your relationship with food– and by extension, get your life back? If so, reach out to us today to get started on your road to recovery. I’m Dr. Amy Boyers, a Clinical Psychologist in Miami who specializes in eating disorder treatment (all types including anorexia treatment, bulimia treatment, and binge eating treatment) and other long term conditions, including addictions, bipolar, and OCD. I offer personalized and sophisticated eating disorder treatment services, individual and family psychotherapy, family member support and education, in-home meal support, cognitive behavioral therapy, anxiety treatment, depression treatment, and much more. Have any questions about the eating disorder recovery process? I’d be happy to answer them. Simply reach out to me and I’ll be sure to answer anything you want to know. I look forward to helping you obtain a brighter tomorrow. Want to learn more about other eating disorders? Read our full guide to the different types of eating disorders. Created by Internet Marketing Company The Bart Organization, Inc.